In this episode, Manny Coats discuses: reviews, review services, product pricing, sales goals and more! How much should I set the price of my product in Amazon? What is the sweet spot for setting product prices? What are other costs should I take into account before setting my product price in Amazon? How does PPC advertising drive traffic and sales for my product? Why is it important to get product reviews? How do I get my products reviewed in Amazon? How many products should I start with selling in Amazon? How many units of my product should I aim to sell? When do I start to expand my product count? Are you wondering what price range to shoot for when choosing products to private label? 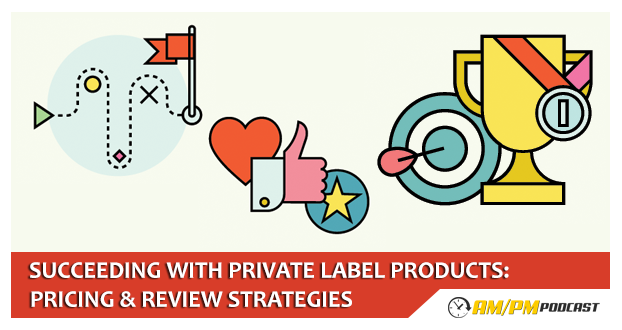 In this episode we discuss pricing strategies, how to get reviews early on after your product launch and setting goals for your private label business. The price point of your product depends on how much profit you want to earn per sale. In most of my products I aim to get at least $10 profit per sale if my product price is around $30. If my product’s sale price is higher, around $60, I aim to get $20 to $25 profit. I highly recommend you keep the price point of your first private label product below $30. At $30 or below most purchases will be impulse buys. The higher the price goes, the more research will go into a purchase and conversions will inevitably drop. Lower price points also help reduce the number of product returns, people in general are less likely to take the time to return a $20 product than they are to return a $100 product. When creating your product it is very important you discuss with your supplier all the small costs that could drive the final price up. These costs include (but are not limited to): Cost of the product itself, cost of shipping to the USA, cost of shipping to Amazon warehouse, cost of labeling, cost of placing FNSKU, inspection costs, product placement costs, sample/review copies, pay per click advertising, creating a website for your brand, trademark registration, suffocation stickers, Amazon fees. Now that you’ve set the pricing on your product it is time we start getting reviews for your product. The old way of doing this was to ask friends and family to review your products for you, unfortunately Amazon frowns upon this practice because it is very unlikely for these reviews to be unbiased. Another option is to create a group on Facebook where you give away your products for free or at a steep discount in exchange for a review. This could be effective, but it takes lots of time and effort to get these groups large enough for them to work as needed. Last, but not least, there are review services. These review services charge a fee to sign up, or to place your product on their lists, their users will then sign up to receive a coupon code they can use to purchase your product for a very low price or for free; in return, these individuals have agreed to review your products for you. Although there is no guarantee that these people will review your product (it’s against Amazon’s TOS to force people to post a review), it’s likely that about 70% of the people who use your discount codes will end up reviewing your stuff. It’s important to mention that these reviewers must mention they got the product at a discount in exchange for a review. Keep in mind review services cannot and should not guarantee 5-star reviews; these reviews must be real and objective, so if you’re product is sub-par, you run the risk of getting bad ratings on the products you give away. It is recommended that you get five to ten reviews before turning on pay per click advertising; this way potential customers will have some idea of how good your product is and they will be more likely to hit the buy button. When it comes to pricing, an approach that has worked great for us is to start below the top competitor, but not necessarily the lowest of all competitors. The reason we do this is that when a potential customer sees our product next to the top competitor’s, we want them to see that although we have fewer reviews, we’re cheaper. In many cases, this is enough to tip the scales our way. At the beginning it is hard to set sales goals for your products. We recommend starting out with a sales goal of 500 units per month, before expanding out to your next product. Each product will require your time and attention; there will also be marketing expenses to take into account. If you don’t have the infrastructure in place and the financial means to automate these tasks, launching multiple products simultaneously will be a daunting task. Once you notice a diminishing return on your time investment, you might want to consider launching your next product. A great way to get ideas for your next product is to look at what Amazon recommends on your product sales page. Notice the section that says: “Customers who bought [YOUR PRODUCT] also bought [OTHER PRODUCTS]”. These “OTHER PRODUCTS” are great places to start your search for your next hit. Listen to this episode to learn more!